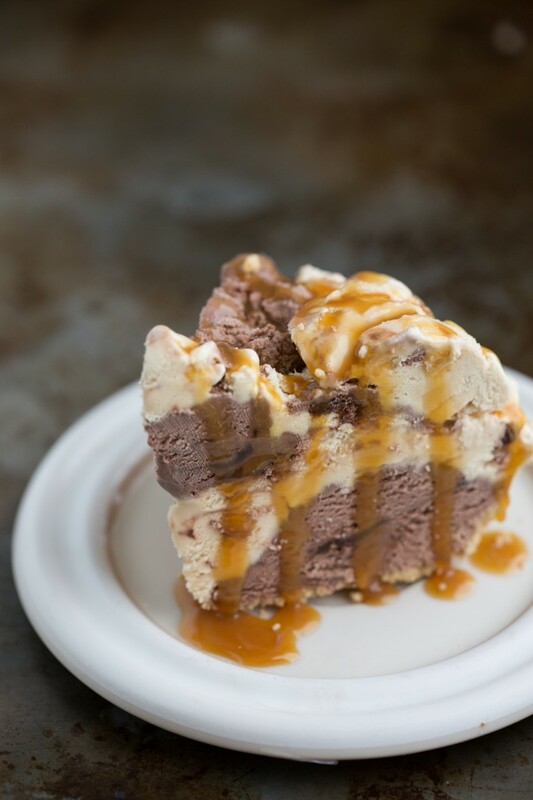 A three-ingredient, ten-minute preparation salted-caramel truffle and chocolate fudge brownie ice cream pie that will be a huge hit for any party. Ready for the secret recipe that my mom invented and has been seriously famous at our house? Yeah, people LOVE this recipe and, honestly, we ate it probably once a week during the summer growing up. Family dinner, dinner parties – you name it; this was on the menu! As far as I know, my mom invented this dessert, and well, to be honest, it’s not even much of a recipe. More of a concept; you’ll see what I mean. It starts with a graham cracker crust. To keep with the ease and to make this 3-ingredients, I bought the graham cracker crust. However, if you have the extra time and want to, you can make your own graham cracker crust and put it in a pie tin. Next you pick two flavors of ice cream. For this recipe, I chose a sea salt caramel truffle and chocolate fudge brownie. I’m a sucker for salted caramel. And chocolate? Well, I can’t go a day with out it. #chocolateaddict. I tried to illustrate the steps with the picture above. 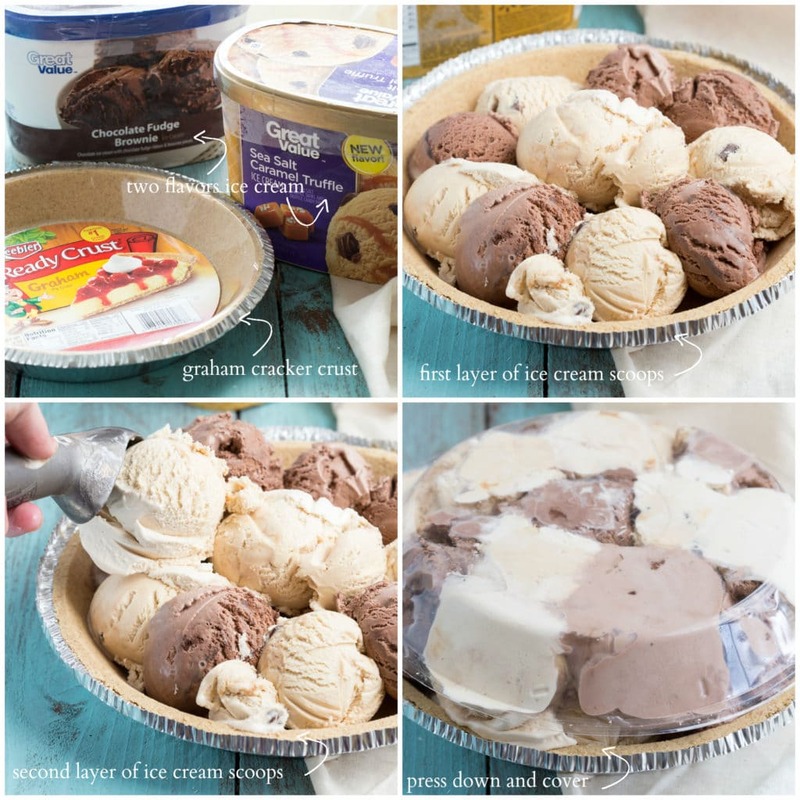 Basically you just scoop the ice cream into the pie tin. One scoop of flavor choice #1, then one scoop of flavor choice #2, then flavor #1 again, flavor #2, etc. etc. The ice cream scoops with cover the bottom of the crust and then you do one more layer. Finally, you press it all together with the plastic top that came with the graham cracker crust. If you chose to make your own crust, you can press together the layers with parchment paper and your hands. Once it’s solid and together, it’s time to freeze the ice cream pie until it’s hard. Then you can cut it up, and serve. And naturally, I had to include some topping ideas. My mom just used a can of whipped topping and did a pretty little swirl on all of the pieces. Totally a great way to finish up the pie and make it look pretty. For these flavors, I used some miniature chocolate chips and caramel sauce. With a little bit of coarse salt of course. Extra salty caramel and chocolate flavors. Remove the packaging for the graham cracker crust. Set aside the plastic "lid." Allow the ice cream to sit out to become barely softened. Scoop one flavor into the graham cracker crust and then scoop the other flavor right next to the first scoop. Scoop the ice cream, alternating flavors, in a circular motion all the way around the pie crust. Scoop the flavors in the center. Repeat step four right above the first layer of ice cream scoops to create a second layer of ice cream. Press the plastic from the graham cracker crust into the ice cream to press it together. Place in the freezer to completely re-freeze and harden. (Try not to let the ice cream get too soft/melted or it could get icy once it is re-frozen). Once the pie is hardened, cut into large slices and, if desired, top with a small handful of miniature chocolate chips, a drizzle of caramel sauce (I used Hershey's), and some coarse sea salt. This looks amazing! So easy & perfect for a summer treat! This looks amazing, Chelsea! Ice cream pie is the best and I love your choice of toppings! I have just died and gone into dessert heaven. This might just be the best idea I’ve ever seen. Gal, you’re a genius! Just the title of this recipe has me drooling, Chelsea! This pie looks absolutely amazing! Especially with the caramel sauce…delish! Ooh, that is so fun, getting to pick the theme! I like the way your mom does it – I need this in my life weekly (ok, daily would be nice, but probably not the best habit 🙂 ) You had me at fudge brownie ice cream! Why have I never seen or made an ice cream pie before? Brilliant! This looks so good! I can’t wait to try! All of the pictures of the desserts look yummy. 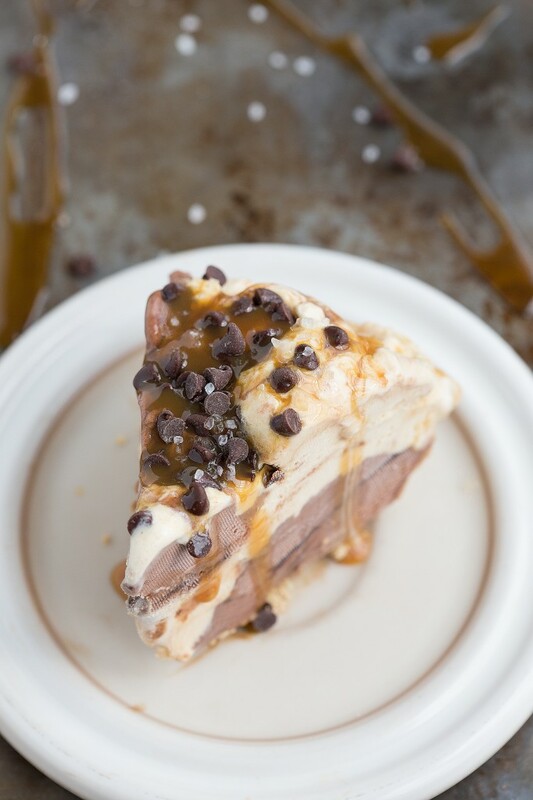 Holy cow, I’m dying over this pie! 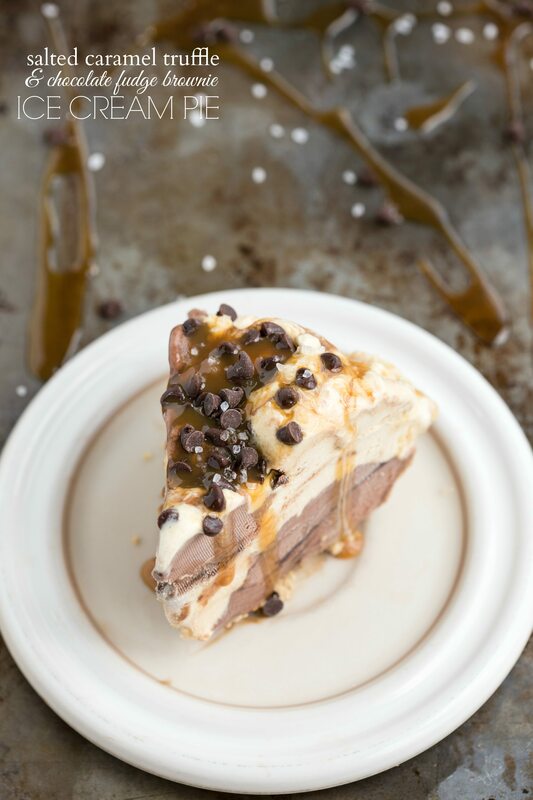 Ice cream is my kryptonite and in pie form makes this even better! 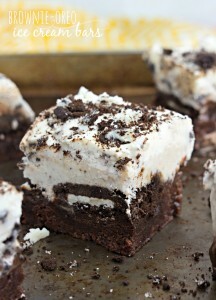 Love how easy this is to make and with only 3 ingredients makes this even more irresistible! Haha a very smart lady 🙂 Thanks Kayle!! 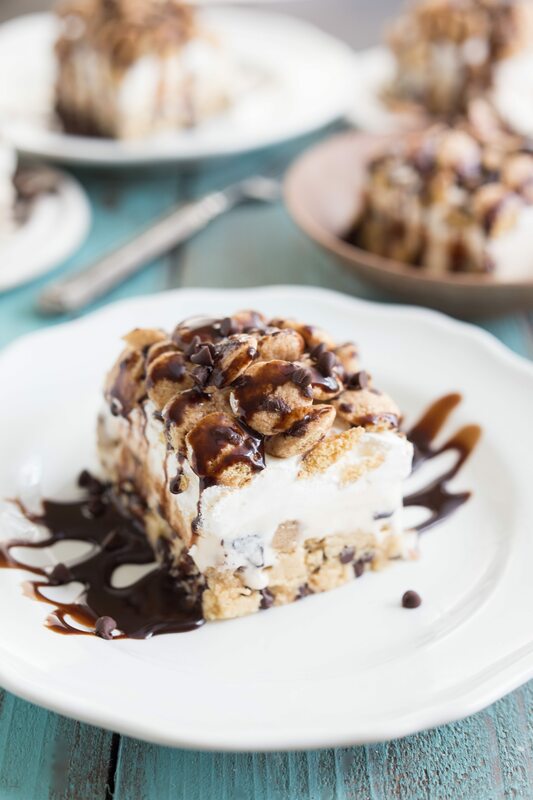 I love this super easy awesome dessert! 🙂 Your mom is a genius! And your toppings for this are spot on! Pinned!